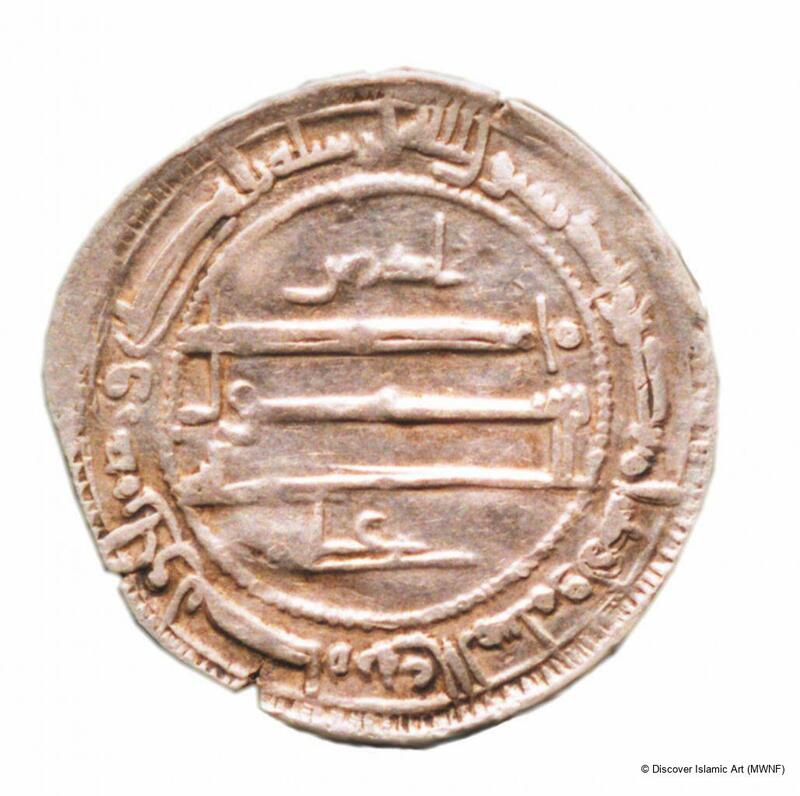 This silver dirham, issued under the reign of Idris II, ruler of the country from AH 188 to AH 213 (AD 803–28), is a prototype of Idrisid coinage struck using models of Abbasid coins with the name 'Ali' (Ibn Abi Talib), son-in-law of the Prophet and ancestor of the Idrisids, added to the name of the reigning prince. This round coin is marked exclusively with archaic kufic script in the centre and around the rim. The profession of faith is proclaimed and the name of Ali is added in the centre of the obverse side, which is surrounded by two circles the second of which is decorated on the outside with five double rings. 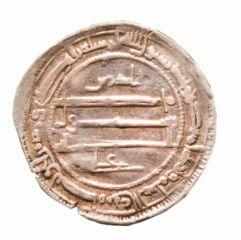 On the edge, an inscription reads 'There is no god but Allah alone, who has no equal, Ali', which is surrounded by another inscription stating, after the bismala (consecration formula), the location of the workshop and the date of issue: 'In the name of God, this dirham was issued at Watit, in the year 202' (AD 818). 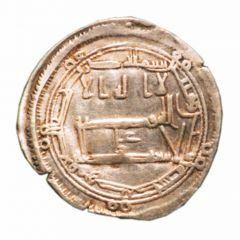 On the reverse, in the centre, the name of the reigning prince 'Idris' (for Idris II) appears, as does the prophetic mission 'Mohammad God's prophet' again with the name of Ali. The ninth verse from the Qur'an Sura 61, Assaf (The ranks), appears on the rim between two circles, in beautiful kufic script: 'He it is who sent His Apostle with guidance and the religion of truth to set it above all religion; averse although the idolaters may be'. This silver dirham is the prototype for Idrisid coins. 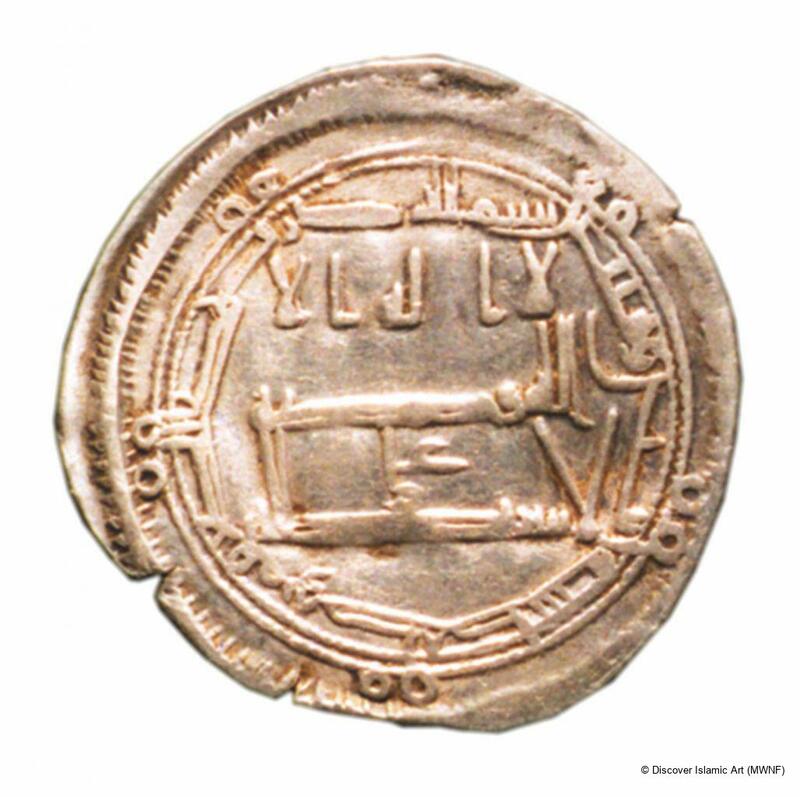 It was minted using an Abbasid model with the name 'Ali, son-in-law of the Prophet and ancestor of the Idrisids, added to that of the reigning prince. The date is shown in the circular part of the obverse of the coin. This coin was bought along with the entire Brèthes collection. An enlightened numismatist, Brèthes lived in Morocco in the first half of the 20th century, and built up an important collection of coins found in Morocco from periods throughout its history, from Antiquity to 1940. The place of minting is shown on the coin. Brèthes, J. D., Contribution à l'histoire du Maroc par les recherches numismatiques, Casablanca, 1939. Eustache, D., Corpus des dirhams idrissides et contemporains, collection de la Banque du Maroc, Rabat, 1970–1. Eustache, D., “Les ateliers monétaires au Maroc”, Hespéris, 1970, pp.95–102.